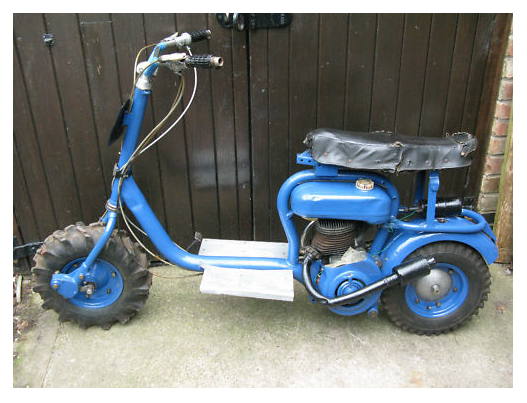 Here’s a bit of a rarity I stumbled across on eBay, a dual Lambretta/Serveta branded scrambler style moped 50cc motorcycle (It ain’t a moped – see the comments). Rarity usually demands a premium in the Lambretta world, but this is currently sitting at just £400. If you’re like the look of it, or just fancy something a bit different for your Lambretta collection get your bid in! The Lambretta scrambler that is for sale on eBay that I posted previously comes with some cine film footage of scooter scrambling… which prompted me to do a little search on YouTube. I found this marvelous period video. Who knows… that eBay scrambler could even be on the vid. I love the precision tools being used for the last minute adjustments… seemed you only really needed 3 tools… a hacksaw, a hammer, and a bigger hammer! One of the more unique Lambretta’s on eBay at the moment, this scrambler dates from the mid 1960’s, and comes complete with some history and a box of cine film, from period scrambling events! It’s an amalgam of a 1957 frame (A Model D would be my guess) and LD 150 engine, which has recently had a pro rebuild. It’s not looking terribly road legal… but it’s not for that. Imagine the fun you’d have (and the looks you’d get) blasting about the campsite on a rally on this! It’s currently sitting at £3,300… which puts it in the same price bracket as a new LN. Here’s the link.